As the Olympics, championship and regatta season draws to a close what better time to think about doing something a little different this autumn? This September 17th and 18th will see the 50th running of the West Lancashire Yacht Club 24 Hour Race (see Y&Y Top Ten Sailing Events to do before you die). With just under a month to go we already have 66 teams, the return of the grandstand and popular band Elephant Juice confirmed. This year we will also have two additional races, including Bart's Bash and a special race at 4pm on Saturday for sailors who competed in the very first race in 1967. Check if your club was one of the fifty at that very first race. Our members have been busy trawling through their lofts and cupboards and our Commodore has discovered a copy of the very first programme from 1967. We thought you might enjoy reading this: in particular the 'blogs' the clubs have written about themselves, their sailors and their chances of a win. Back to 2016.... go to www.wlyc.org.uk for more information, or like our Facebook page, or follow us on Twitter (@WLYC24). 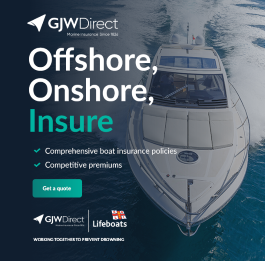 We would also like to thank our major sponsors Dream Yacht Charter, Marine Supplies Direct and GJW Direct for their support in this very special year.